Mid and East Antrim Borough Council will mark a major milestone in the history of Ulster links with America when they commemorate the 300th anniversary of the departure of the emigrant ship Friend’s Goodwill from Larne this year. The vessel set sail in May 1717 with just over 50 passengers on board and arrived in Boston Harbour the following September. What accounts survive suggest that the voyage was a difficult and anxious one for the passengers. Food and water supplies ran so low that lots were cast for who would be eaten if the worst extremity came to pass. The Friend’s Goodwill is so significant since she is, as far as can be defined, the first specific emigrant ship from Ulster in the 18th century. To some extent she is a mystery ship since records have not survived of the passenger list. We do know that she returned the following year to Boston with more passengers. In 1717 among those arriving in Boston from Ireland was a John Patterson of Carrickfergus and a Thomas Brenan from Carrick is also reported arriving at the same time, as is a James Patterson. One certain passenger on the Friends’ Goodwill the following year - when we do have a ship’s record - was Widow Gibson, who arrived from the north of Ireland with two children. Another passenger on the ship was named James Hannah. This entry in the Sessions of the Peace for Suffolk County proves that the ship was making regular voyages from Ireland, probably conveying goods as well as passengers. To some extent the Friend’s Goodwill and her voyage has been historically overshadowed by the arrival of five ships from Coleraine in 1718, carrying the first organised mass emigration from Ulster to America. The Friend’s Goodwill was, however, a pioneer in terms of the start of the migratory movement. Her passengers may have dispersed from each other’s company after their arrival in America and became, simply, anonymous emigrants. But she was in the vanguard of an astounding migration of people who provided Presidents, frontiersmen and women, teachers and educationalists, writers, military leaders and, ultimately, even astronauts – if we take Neil Armstrong and James Irwin into account. Whatever events are planned by the Council to mark the 300th anniversary of the departure of the Friend’s Goodwill, a lasting legacy remains the memorial statue in the Curran Park. This pays tribute to all those who emigrated in the 18th century and was part of the efforts of Larne Borough Council’s Ulster American Committee in 1992. 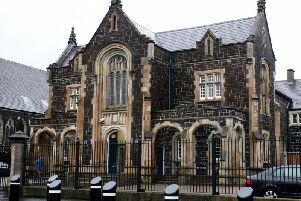 The Committee was established in 1991 after the Lurgan-based Ulster Society raised the forthcoming 275th anniversary of the Friend’s Goodwill with the Council. Under the chairmanship of well-known local historian Liam Kelly JP, the hard-working group and council staff put together a major festival to mark the anniversary. A week-long series of events took place to mark the major milestone in May 1992 including an American football match, historical talks, social events and a pageant parade through the town centre involving schools and civic groups. Longer-lasting legacies included the American statue, an American trail and twinning between Larne and the town of Clover in South Carolina.